Meanwhile, three of my earlier pieces have come down. 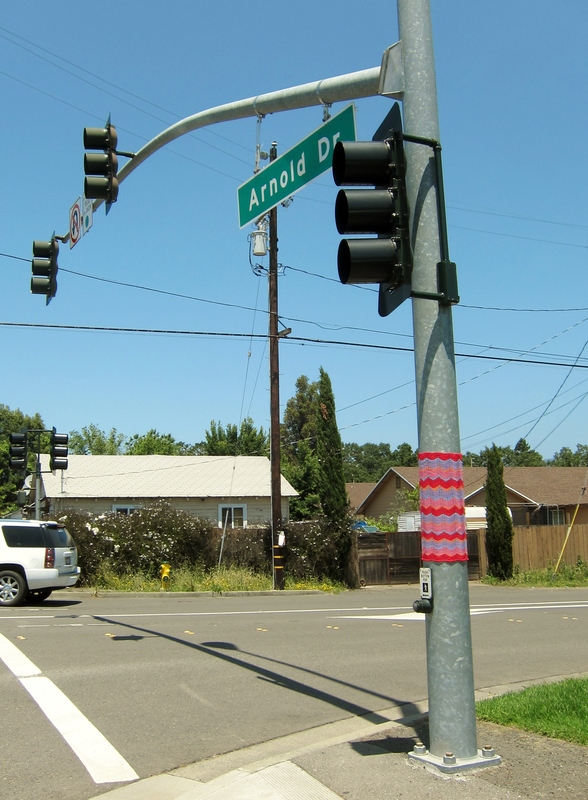 The one I put up at the corner of Arnold and Grove was taken down by the workers who service the traffic signals (I happened to be driving past when they were tossing it into the back of their truck). It lasted a month, though, so that’s not bad. 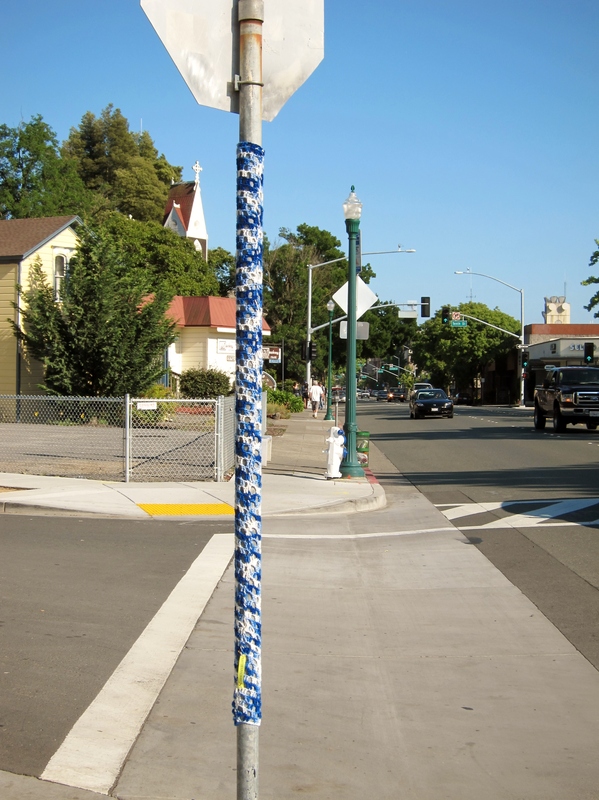 The one at Arnold and Mission disappeared a few days later. 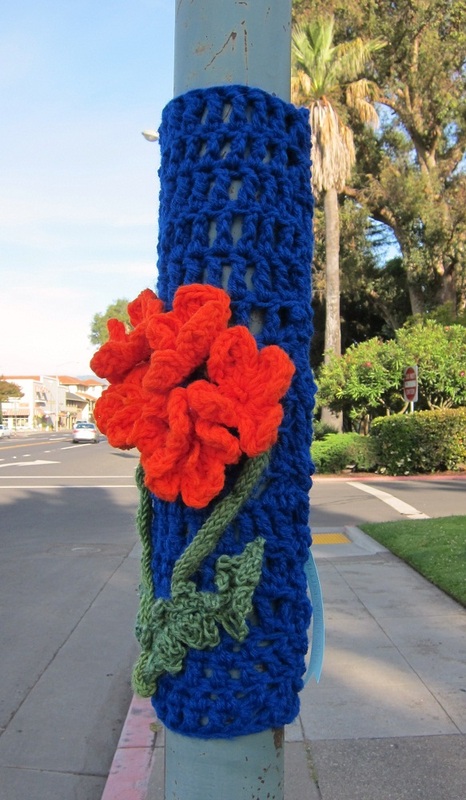 That was on a traffic signal pole too, so I’m maybe sensing a pattern here. 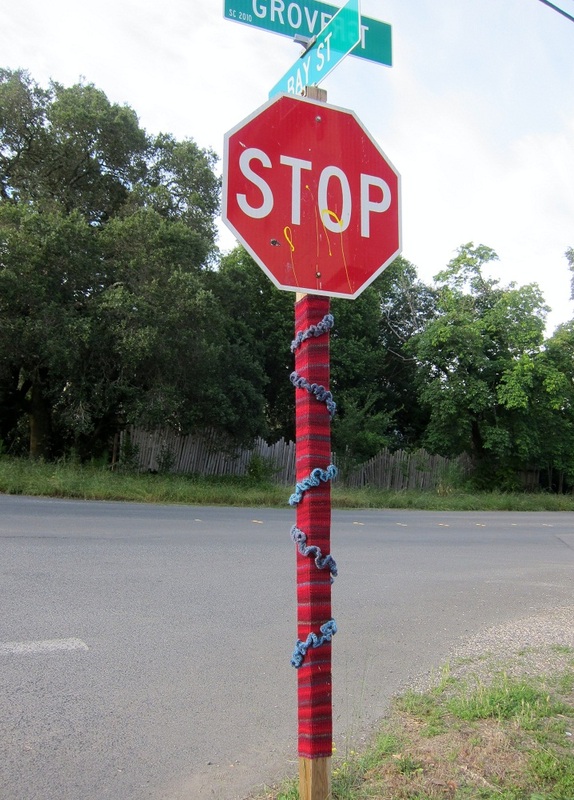 The third came down today at my own hands – the granny square thing on highway 12 near Tillie’s shop was looking pretty sad, so I took it down. I plan to wash it and possibly find another use for it elsewhere. 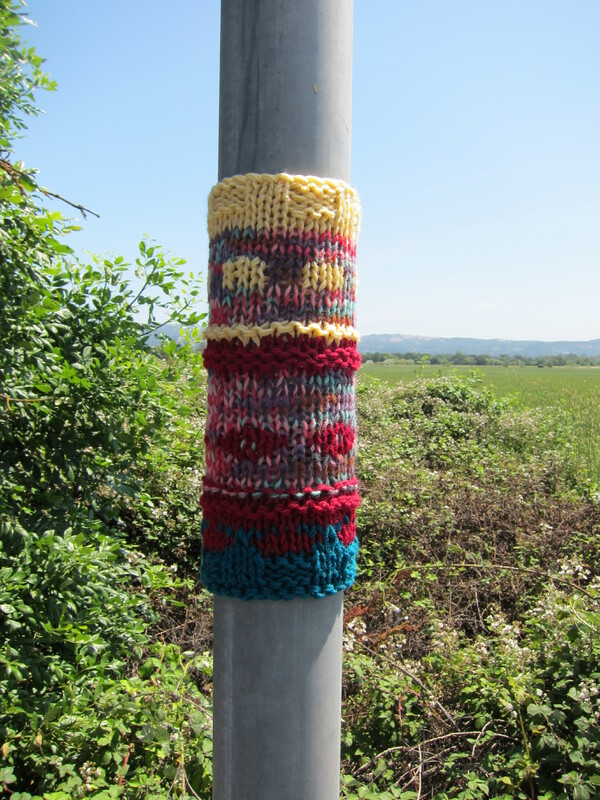 Other than some sun fading, it held up pretty well, but it always was too big for the pole I put it on. 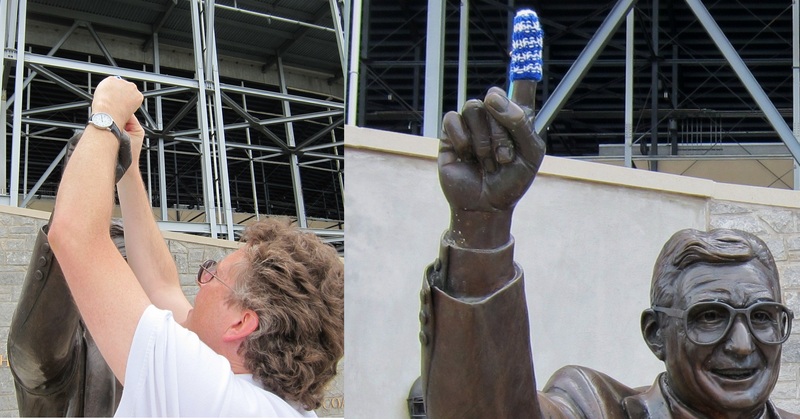 Back from Pennsylvania, where my sweetie’s folks very much embraced the idea of adorning Penn State’s statues with whimsical knittany, if only briefly. 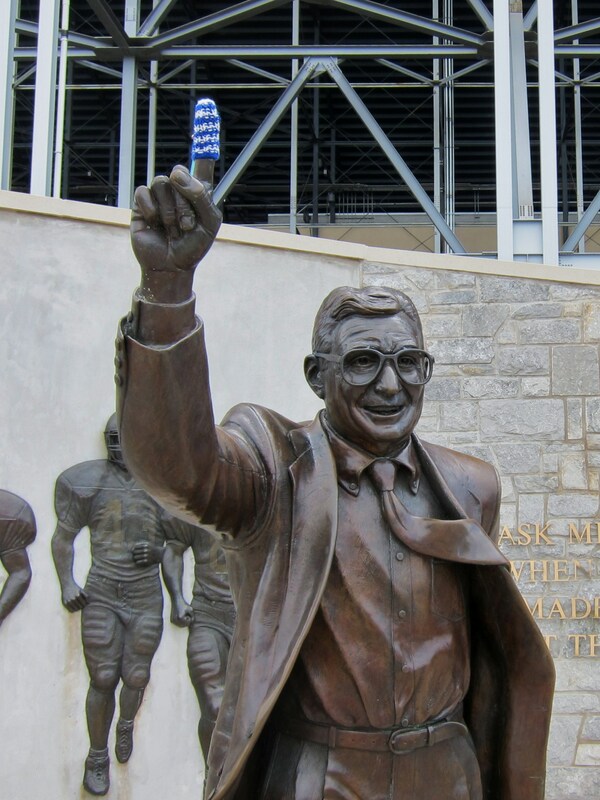 First up was what I initially heard as “the Joe Pistachio” but actually turned out to be “the Joe-Pa statue.” So sue me, I’m a new initiate to the strange world of college football. 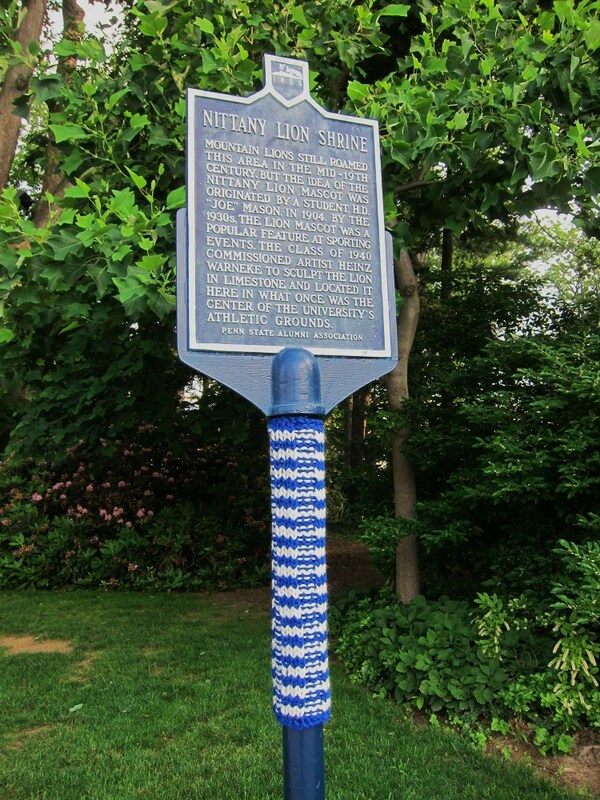 Of course no statue at Penn State is more attractive to the guerilla knitter than the Knittany Nittany Lion Shrine, but I also knew that anything I put there would be a nuisance to the constant parade of people who want to be photographed with it. 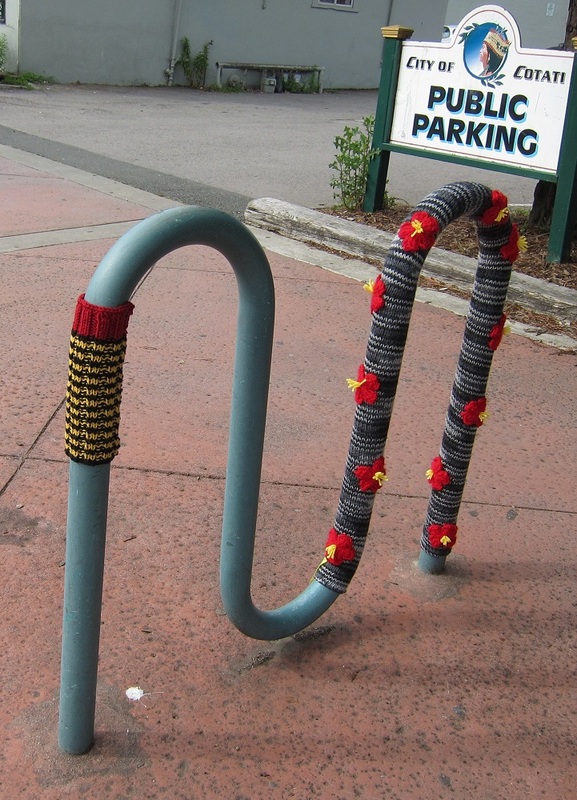 My compromise: I staged the photo below, removed the knitting, and redeployed it nearby. I even went so far as to paint the back ends of the needles, which were originally red, so they would match the school’s colors, and not those of arch-rival Ohio. 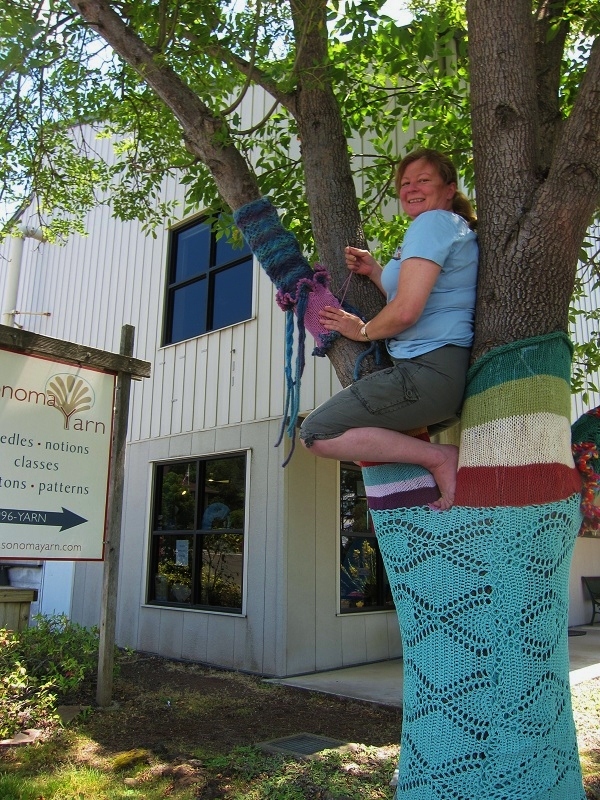 I’d have preferred to have posed the knitting as if there were a row in progress, but the needles just weren’t long enough. Sadly, the campus maintenance personnel, ever diligent in their duties, removed it Monday morning, but it was fun while it lasted. 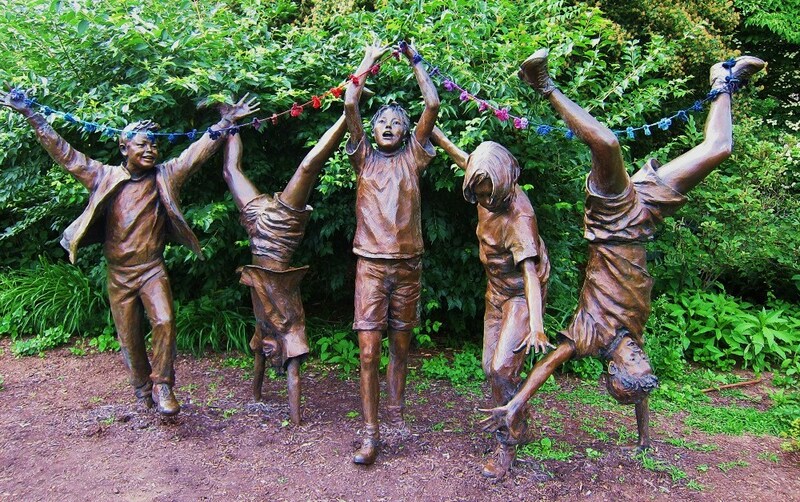 In general it’s my feeling that good statues need no enhancement from the likes of me, so I took the garland down after taking the photos, and am still trying to decide where to put it. I had hoped to find a home for it somewhere in State College, but I slept too late Monday morning. Rats! More projects in the works, of course…. 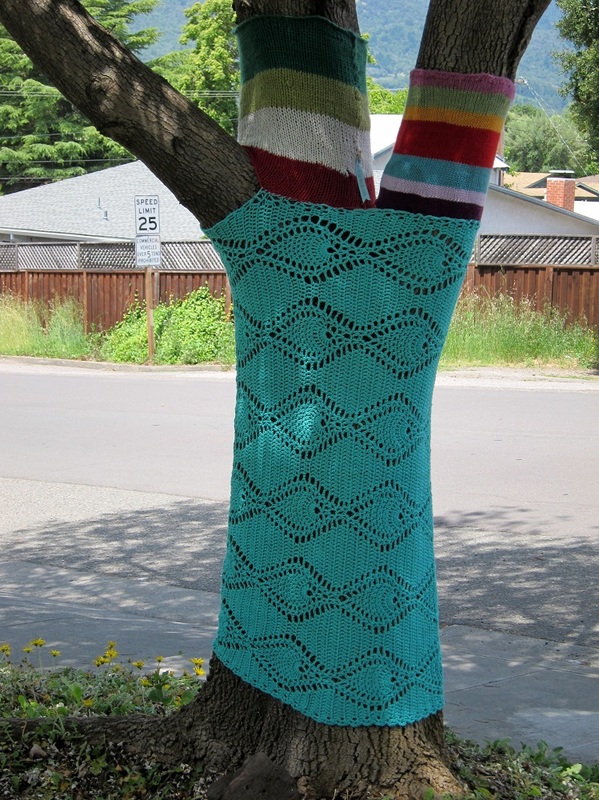 Top secret stuff with some of my new-found knitty friends, and new ideas brewing all the time. Ciao for now. 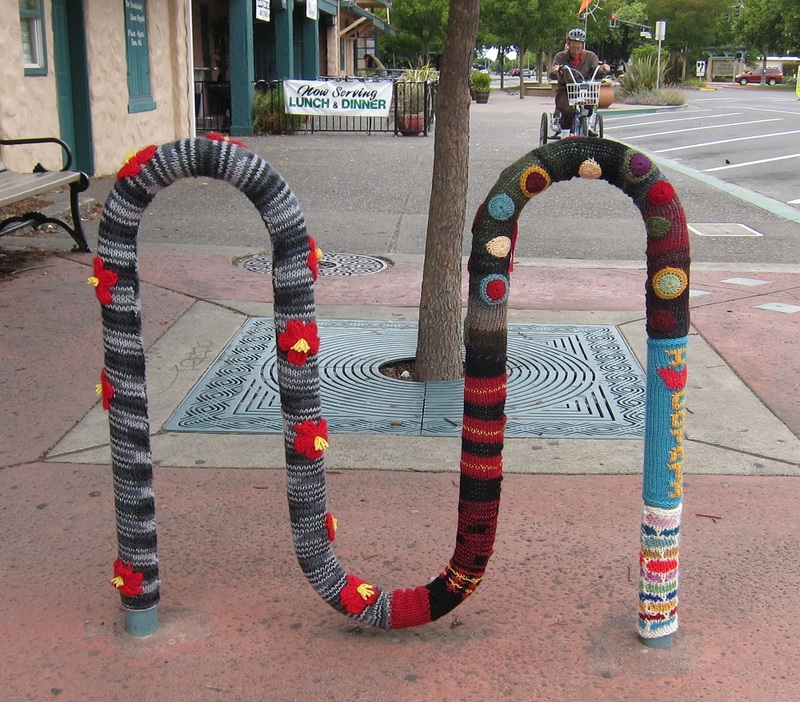 I plan to finish off the last few feet of the bike rack eventually. 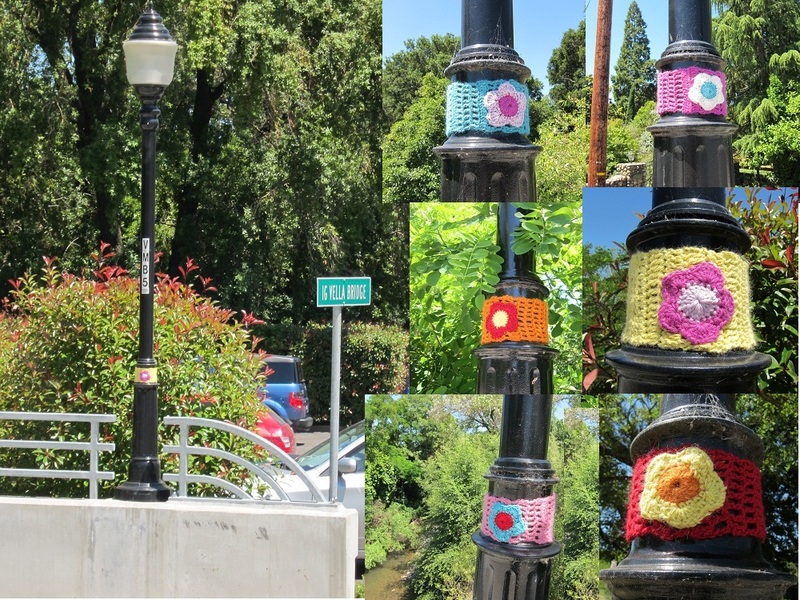 I’ve got about half of the remaining portion knitted and ready to go, but I haven’t had a chance to get into Cotati to put it up. 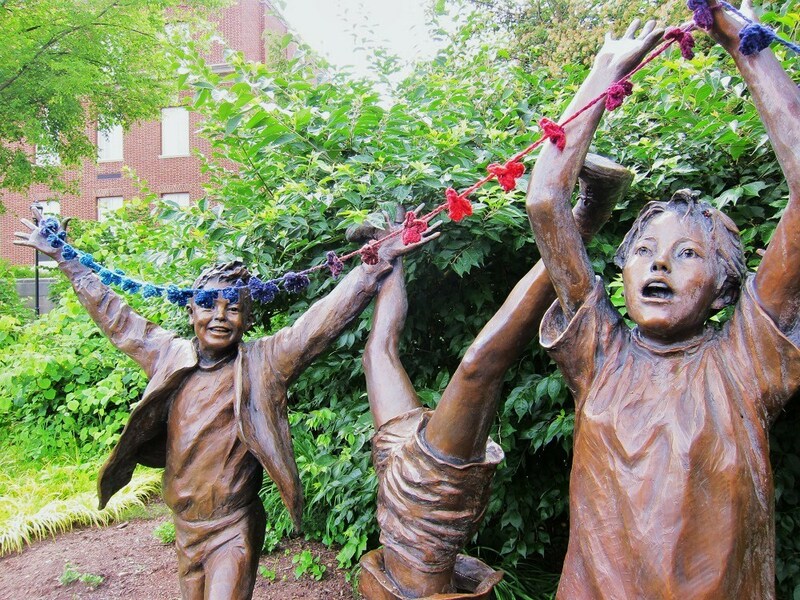 A friend has informed me she saw someone taking a photo of this the other day, which is kinda fun, I think! So anyway, I’m traveling with my sweetie, visiting his parents on the occasion of their 50th wedding anniversary, and we were passing through the Detroit airport with loads of time to fill waiting for our connecting flight. 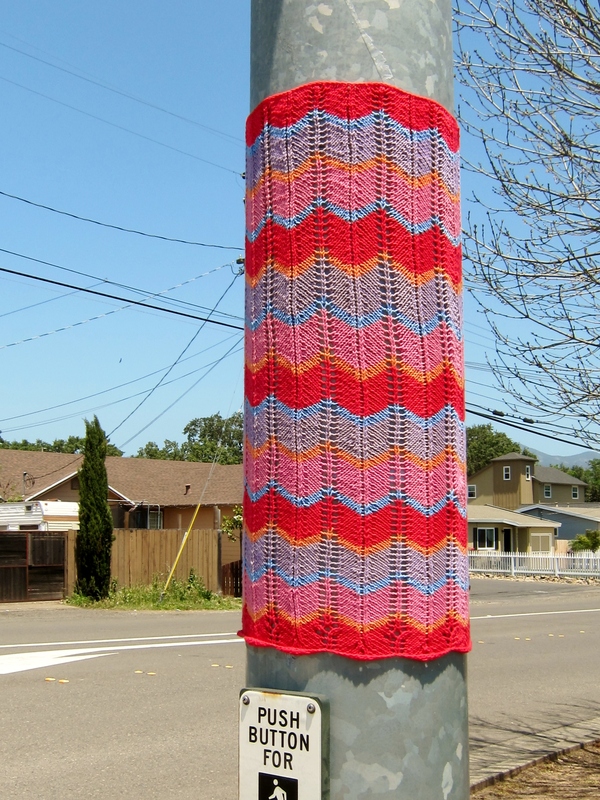 I put a little crocheted piece up on a pole, and a woman watched me while I was working. I looked over and smiled at her, and she asked me about what I was doing. I couldn’t place her accent, but some kind of European. Was I getting paid to do it? No, it’s just something I like to do. 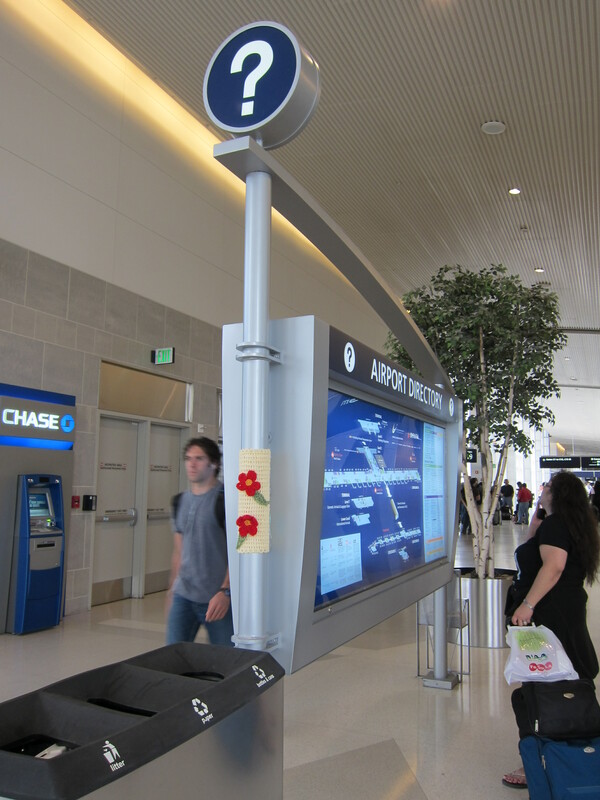 Sort of a gift to the airport, then? Yes, I suppose, or at least I hope people see it that way! Won’t someone steal it? Maybe. Sometimes my pieces stay up for a long time and sometimes they don’t. At any rate, it will be interesting to see if it’s still there on our return. If you happen to be passing through the C terminal, it’s near gate C18. Let me know! 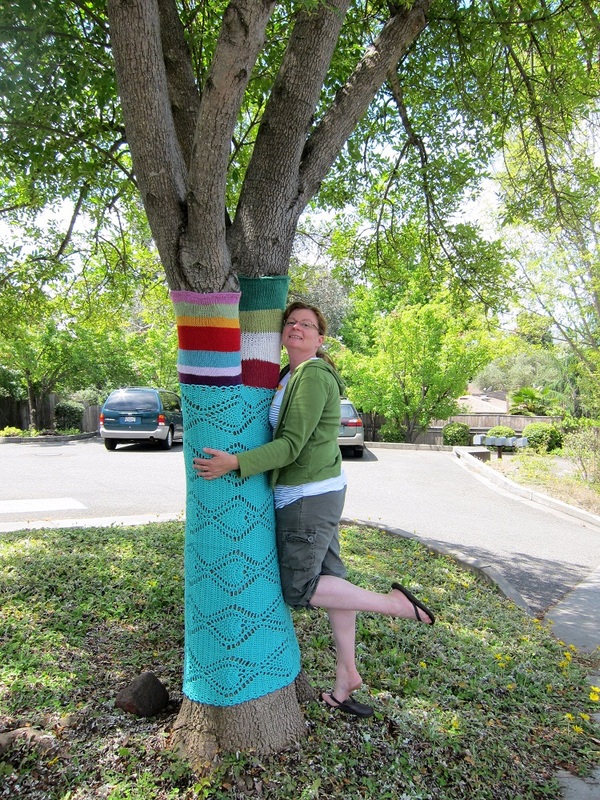 I have several projects planned for International Yarn Bombing Day. My plans have changed several times. 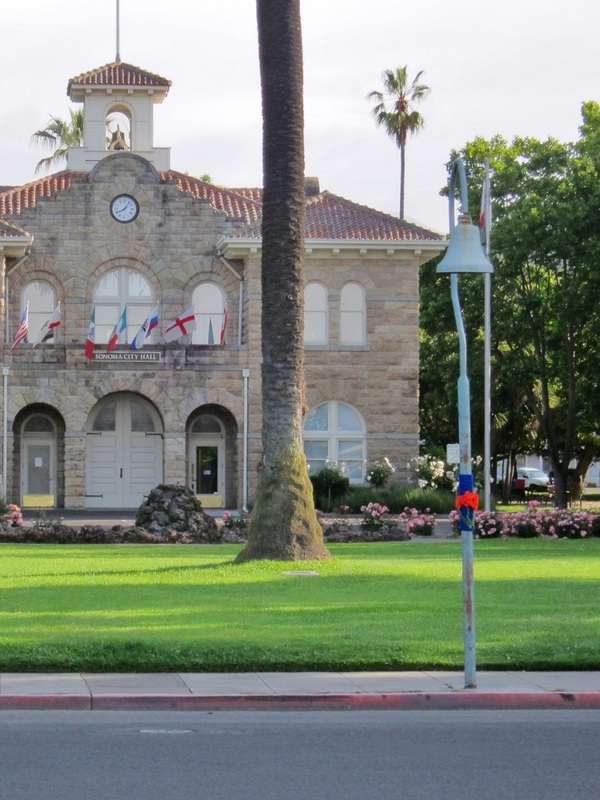 Jim Boggio has been on and off, and on, and off the list. His time will come, when I can do justice to the job, but not before. California poppies on a blue background, made for the northernmost bell marking the route of El Camino Real from San Diego to Sonoma. Since it’s a historical marker I wouldn’t expect the piece to last long. Someone will take it down and throw it away. Yet I want to be proud of what I put up, so there’s a tension between how much I value what I do and how I’ll feel when it’s discarded. 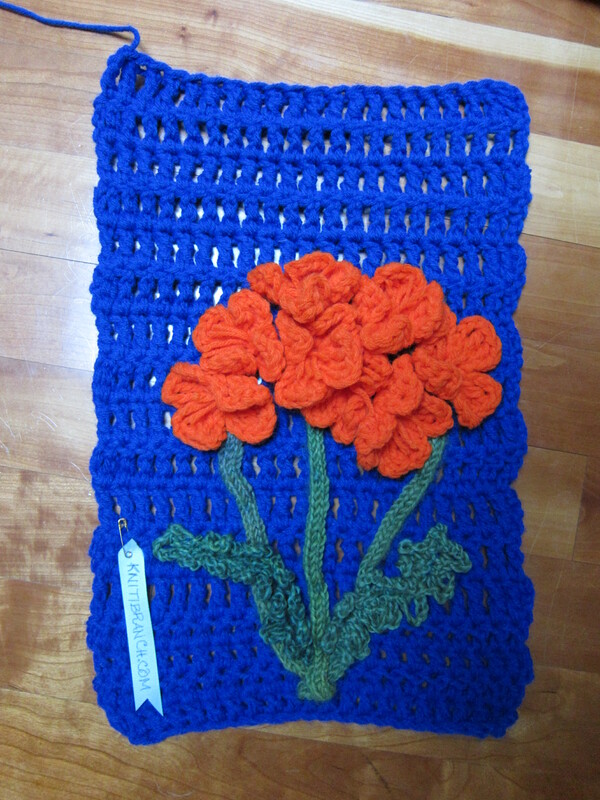 At any rate, this one is made of yarn I bought last week at an estate sale, and I used techniques that would minimize the investment of time, but my heart was in the right place, and I really did try to make it look nice. Tillie’s tree. 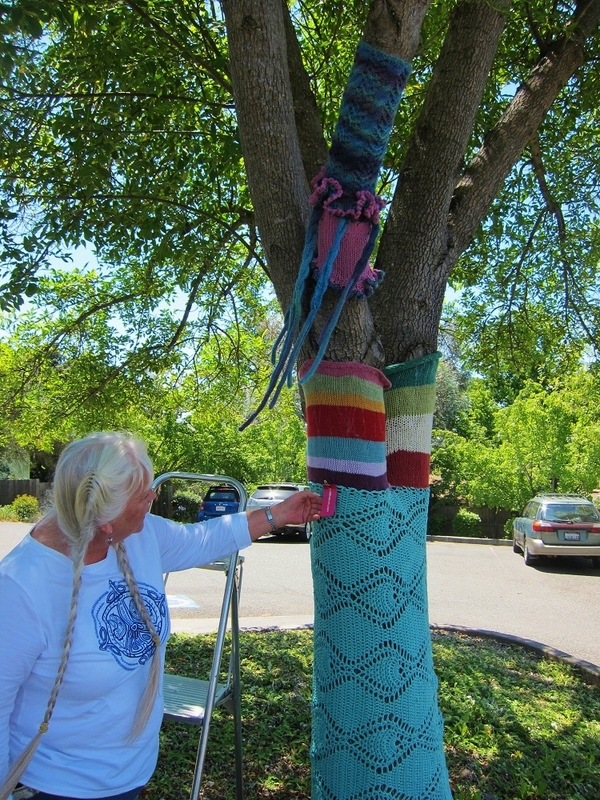 My friend Tillie has asked me to yarnbomb the tree in front of her store, but I’ve made slow progress because it’s such a large project, and I haven’t had much help, and I’ve had other things to work on at the same time. I have a fair bit ready now, though, and I want to get it put up this morning. 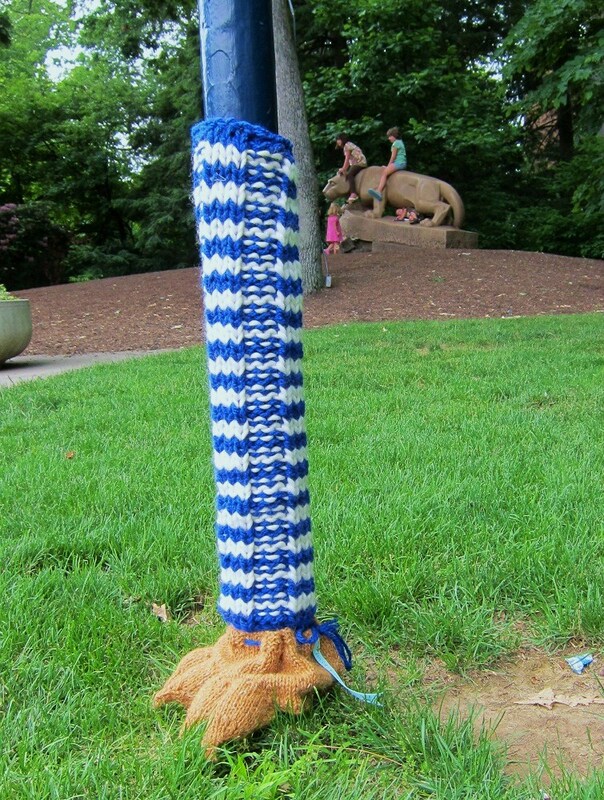 This was one of the first “yarn bombs” I started, a couple-few months ago. 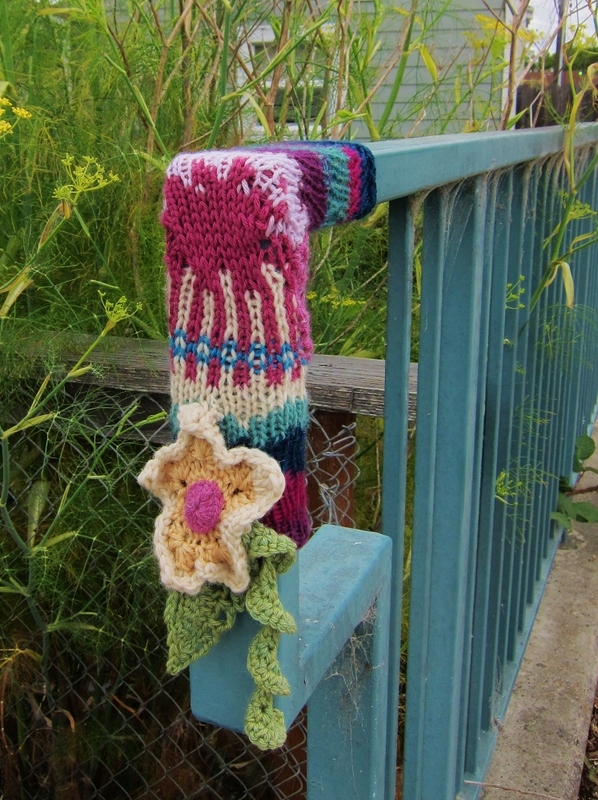 I set it aside in favor of other projects, and just cast off yesterday to get it off my needles and out of my life. 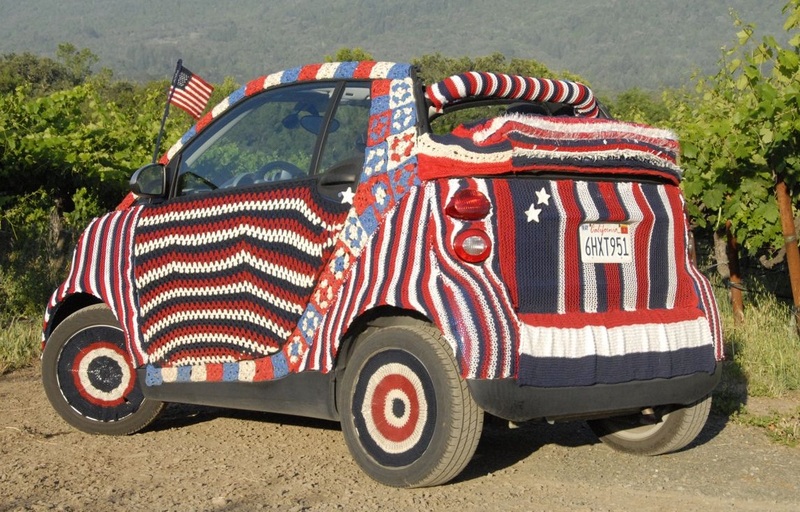 I chose yarns I didn’t like, hence I didn’t enjoy working on it. I felt OK about it in the end, knowing it wasn’t one of my best efforts but glad it wasn’t entirely wasted, either. 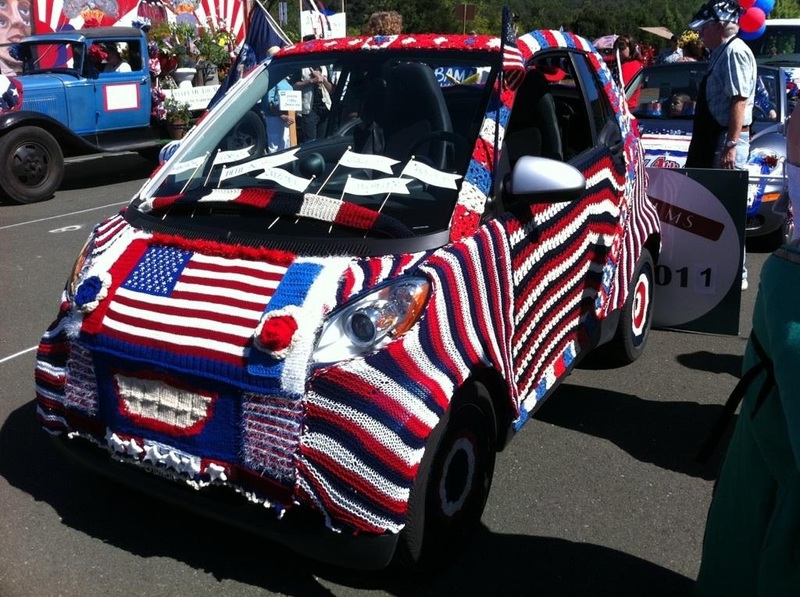 At first I thought yarn bombing might be a way to use up yarn I should never have bought in the first place. Not so. 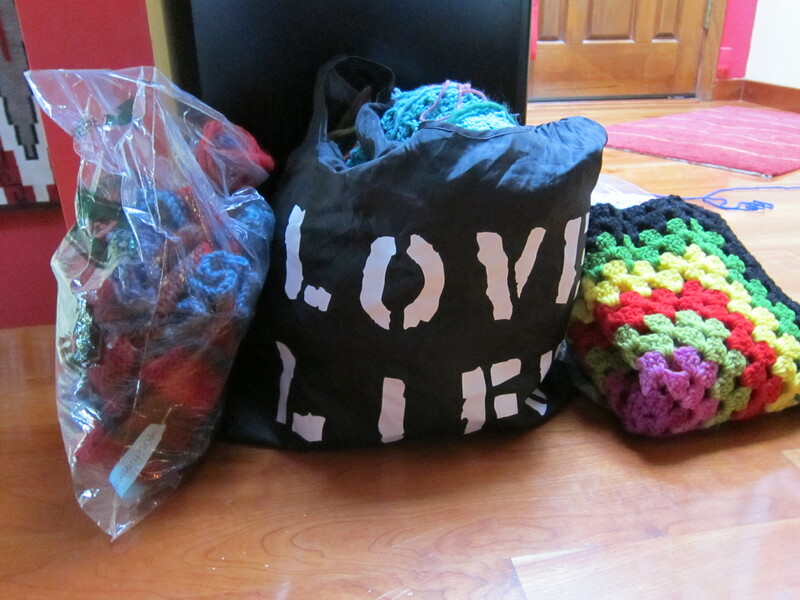 From now on, if I hate a yarn, it goes into the donations pile, not onto my needles! It’s IYBD! What am I doing sitting in front of the computer? More to come…. This was once intended to be a baby blanket, but I couldn’t get the ends woven in to my satisfaction, so it’s been sitting in a cupboard ever since I finished it. I think it’s much better off here than moldering away in storage! 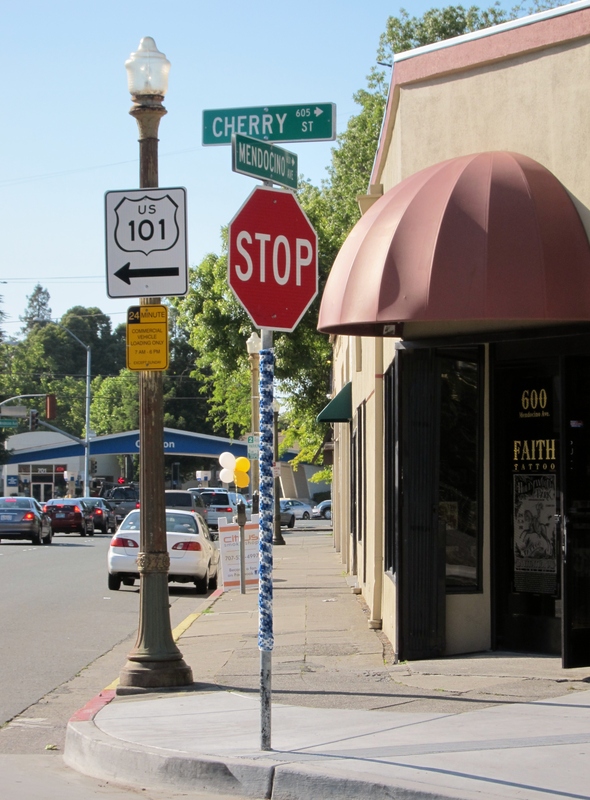 Later that same day I put up a stopsign cozy in Santa Rosa at the corner of Mendocino & Cherry. 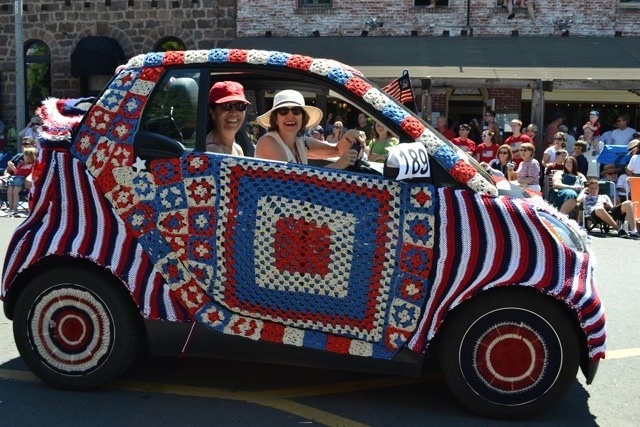 This one came out looking like an homage to Olek, which is kind of funny considering that I’m not really a quick-crochet-with-variegated-acrylic kind of girl, but nonetheless, there it is…. Back from BayCon, the San Francisco Bay Area’s annual science fiction and fantasy convention in Santa Clara, CA. 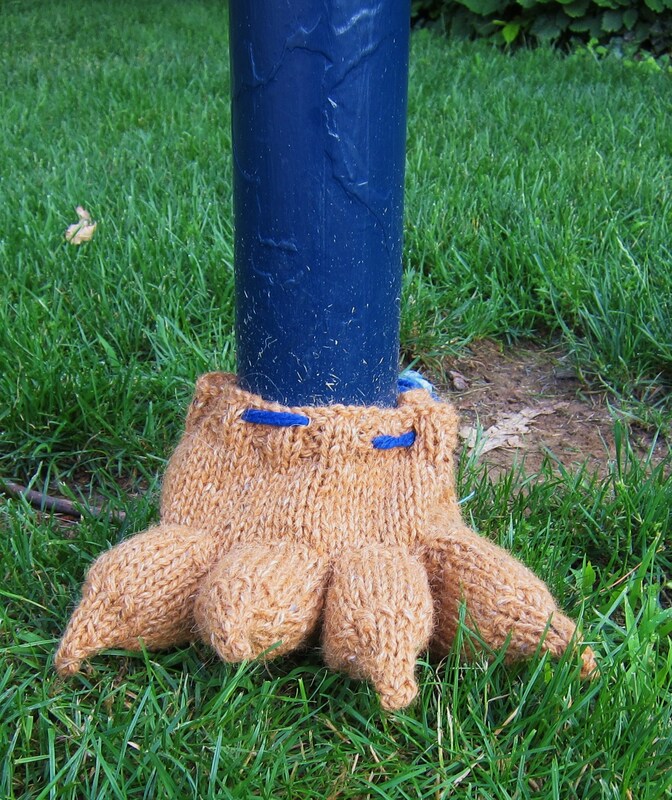 In keeping with the spirit of the con, I decided to go with an adapted form of Chelsea Gunn’s “monster feet” as shown in Moore & Prain’s Yarn Bombing book. 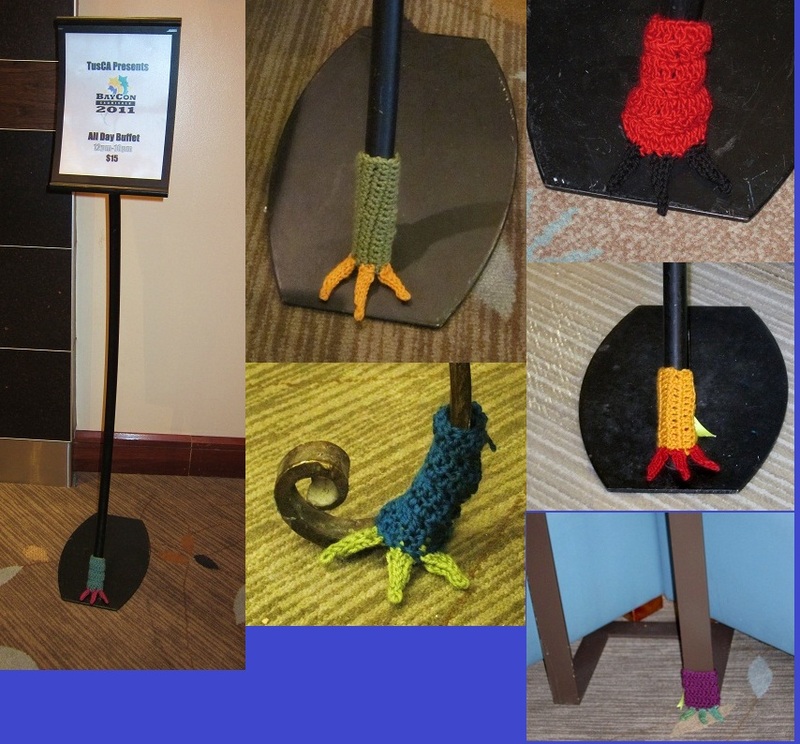 I crocheted the feet to make the work go faster, and knitted the toes in i-cord fashion, placing six feet around the convention site during the first couple days, then returning to my other, larger projects.